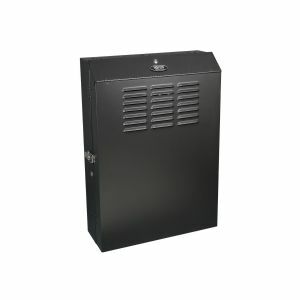 Tripp Lite 5U Wallmount Low Profile Rack Enclosure Vertical 36" Mount Depth - Rack - wall mountable - black - 5U - 19"
Because the low-profile cabinet mounts vertically, it extends less than 10 inches from the wall while housing equipment up to 36 inches deep, including 1U servers, UPS systems, battery packs, network switches and patch panels. In addition to 5U of rack space in the primary mounting area, it also includes a slide-out 2U mounting bracket at the top of the enclosure for patch panels up to 2.5 inches deep. The SRWF5U36 comes fully assembled and ready to mount to the wall. Equipment installation is easy, with threaded mounting holes and hardware that support M6 or 12-24 mounting.